These days, getting outside can be a challenge. #1. Let your stress melt away. Stress is not only hard on us emotionally, but if you’re feeling overly stressed on a regular basis, it also has physical consequences. And, it’s not as easy as it seems to let stress go when you’re in the midst of it. Luckily though, one extremely effective way to release your stress is to simply get outside. In fact, one study found that participants who spent time in a forest rather than in a city had decreased heart rates and levels of cortisol, which is the stress hormone. #2. Enjoy a better night’s sleep. Getting enough quality sleep every night is important for so many reasons, both physically and emotionally. However, actually getting the sleep you need is not as simple as it sounds, especially if you’re one of the millions of Americans who suffer from a sleep disorder. But, you’ll be glad to know that something as simple as getting exposure to sunlight during the day can make a big difference. Sunlight will help to recalibrate your circadian rhythms, or sleep cycle, which can help make it easier to sleep at night. #3. Feel more alive and energized. Energy has a huge impact on so many areas of our lives. When we’re feeling energized, we feel like we can take on the world, and it leads to more enthusiasm and passion in our personal relationships, careers, school work and more. If you feel like you just can’t summon the energy to do much of anything until you’ve had another cup of coffee, it’s time to get outdoors. In fact, according to one study, spending just 20 minutes outside can energize your brain just as much as having a cup of coffee can. #4. Strengthen your immune system. Cold and flu season is just around the corner, and whether you’re in a classroom or an office, sickness spreads quickly and can be difficult to avoid. To make it through cold and flu season unscathed, you need your immune system to be as strong as possible. The good news is that the simple act of getting outside can really help. Being outside helps to challenge your immune system, which results in an increase in white blood cells and helps make your immune system stronger and more resilient. Enjoy the many benefits of getting outside with TreeRunner Grand Rapids. 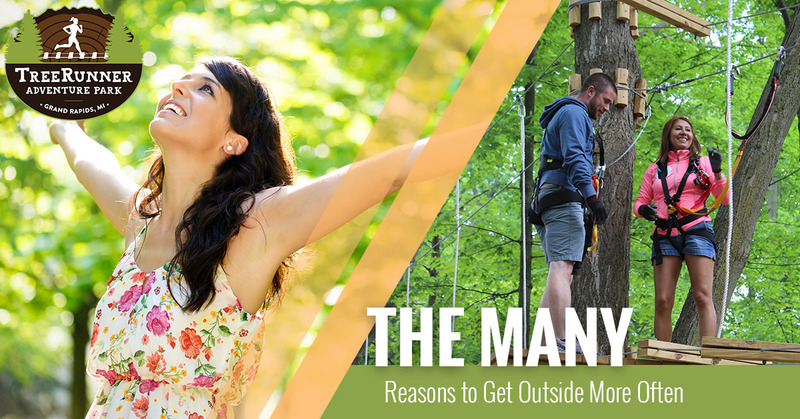 As you can see, there are so many great reasons to get outside more, and we’ve barely just scratched the surface. 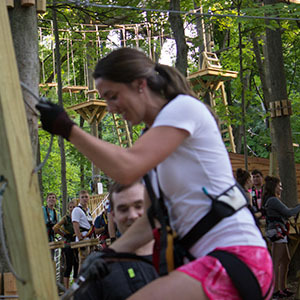 If you’re looking for a great excuse to experience Mother Nature firsthand, it’s time to book your adventure at our aerial obstacle course in Grand Rapids today.